If you’re trying to keep tracking of a ton of news all at once, check out these popular iOS RSS readers for your iPhone and iPad. In the absence of Google Reader (RIP), Feedly has become the standard RSS reader. Feedly is a fully-featured RSS platform that can run in any browser. They also offer apps for reading your feeds on iOS, Android, and even Kindle. Feedly is a well-designed app takes a magazine-style approach to content, organizing articles with large photos in a grid-based layout. It’s attractive and easy to navigate, if somewhat slow for scrolling through hundreds of posts, and it makes completionist news reading time-consuming. The Feedly app’s greatest feature is its ability to surface content that’s the most interesting right now. It does this by keeping track of its own engagement metrics, especially social shares, to get a sense of how “hot” a given article is. The app displays the hottest articles in your feeds first, which is a good way to survey the ironies and outrages that are animating the Internet on any given day. A cool “Must Read” category also helps you keep track of top sources. It’s extremely useful for collecting feeds that post infrequently, but that you don’t want to miss. The app also integrates with a wide variety of social sharing tools, including Twitter, Buffer, and Facebook, as well as article sharing services like Pocket and Instapaper. And you can use IFTTT integration or the iOS sharing menu to add links to services that doesn’t already exist. There’s also a small degree of customization available. Users can choose “day” or “night” modes, and choose from a small number of font families to customize your reading experience. 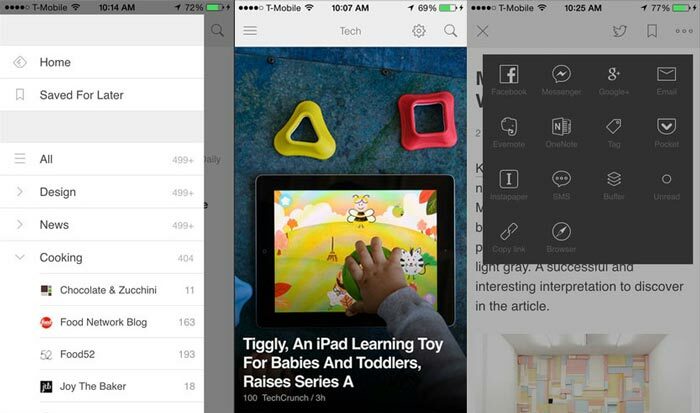 Considering the zero-dollar price tag, the Feedly app brings a ton to the table for the casual news reader. Power users can also sign up for the $65/year Feedly Pro service, which offers alerts, better sharing, and other improvements. 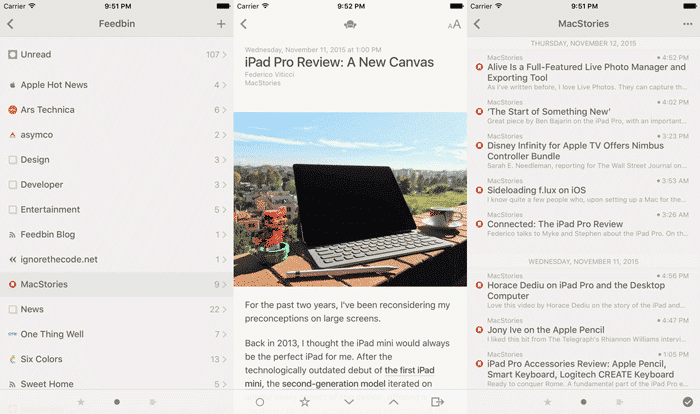 Newsify attempts to provide more functionality than the Feedly app while still keeping the same overall aesthetic. It offers a greater degree of customization than the Feedly app. However, but it’s presentation of information is more cluttered than Feedly’s layout. In the app’s magazine-style mode, pictures are smaller and can be oddly cropped. The app ranks posts entirely on publication time, rather than Feedly’s “hot” metric. This is sensible if you want to read your way backwards through one source, but if you’re trying to get a quick overview of what’s happening in the world today, it’s not ideal. This can make using the app a lot more like using Twitter, but without the commentary: everything is in reverse time order, regardless of its relatively popularity. Overall, the app is functional and powerful, with a greater degree of UI customization than most apps. The magazine mode can be turned off, returning users to list view. 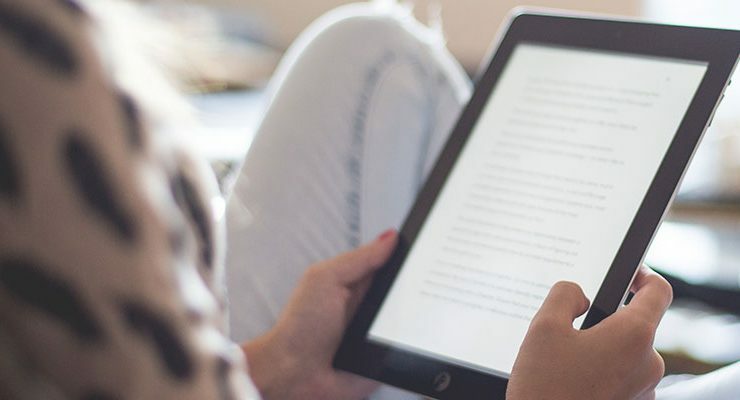 Users can chose from a wide array of typefaces, sync with may different RSS services, and the presentation of individual articles is generally faithfully executed. However, regardless of settings, Newsify doesn’t offer as pleasant a user experience as Feedly does. In general, syncing is slower, and the magazine layout is less attractive. The ad-supported free version is also a little frustrating. The ads are frequently animated and distracting, so you might want to opt for the $2.99 ad-free in-app purchase. 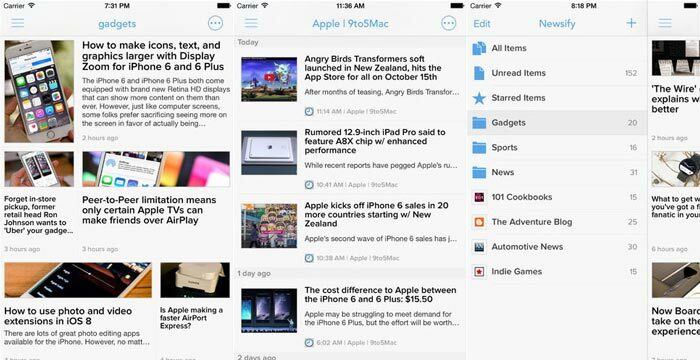 If you like scrolling through your content in a list, Reeder 3 is an excellent choice. It ditches the magazine-style layout of both Feedly and Newsify, opting instead for an old-school, list-based approach. The UI is also more based on folders and feed, without any surfacing of popular posts. Unfortunately, this can be a bit of a frustrating way to dig through information. There’s so much content published by major outlets every day, and scrolling through all that can be pure drudgery. However, if you only follow a few sources, or you want to stay literally up-to-the-minute, Reeder is an awesome choice. It functions with a surprising array of RSS services, including roll-your-own local RSS syncing. It also includes in-app sharing for a long list of services, including lesser-known ones like App.net, Pinboard, and Delicious, as well as the big names like Pocket, Twitter, Facebook and Buffer. Unfortunately, there’s little customization available in the app. You’re basically stuck with the off-the-shelf typeface and design choices, which you may or may not find appealing. An honorable mention should go to Apple’s surprisingly-good News app. It’s not technically an RSS reader, since you can’t add any old RSS feed. But nevertheless, it does a good job of surfacing stories from a reasonable variety of sources. More and more publishers and jumping on the platform, too. As it grows, the News app could become a viable alternative to RSS for those less interested in setup.